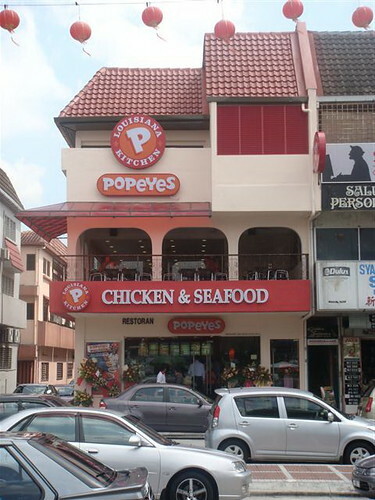 Popeyes opens its doors to Malaysia! So much hype. We decided to go give Popeyes a try. Look familiar? That’s because its first and newest branch is located in TTDI. Chicken Ala-carte 2 piece at approx RM6 and sets at just under RM10, you can tell the prices are set to rival McDonalds. One thing though about this place – you cannot change your mash potato for french fries (in the set) which is a bit of a bummer if you like fries more than mash. The Popeye girls all decked out in bright orange. Clean, crisp and professional looking, they aim to serve and please.. you can tell the owners are watching (and they are, rather closely). This place must have just had their opening because congratulatory flowers line the entrance. At first glance there’s no difference between the left and right photo. 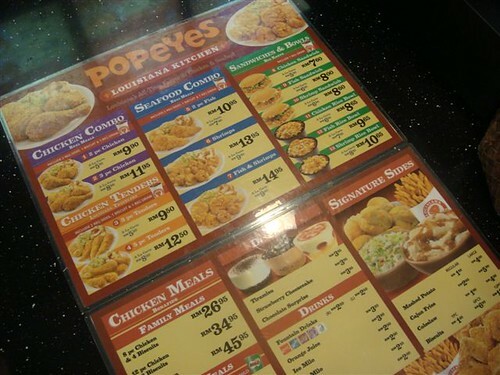 Actually on the left is the famous Popeyes Chicken and on the right, the Fish Tenders. Another thing to note is the boring, unimaginative use of ordinary bottled ketchup and chilli sauce. What? We expected at least some Original Louisiana Hot Sauce for the chicken or Tartar sauce for the fish. How disappointing. Anyway, whilst the chicken was not great, the fish on the other hand … was GOOD! They definitely use fresh water fish. 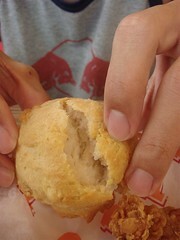 The first bite goes something like this .. Crunchy flaky outer, then soft, succulent and slightly fatty insides. Oooooooo… yum! I particularly liked the fatty bits in the fish. Too bad no special sauce for the fish though. Another photo of the fish because that was the only thing that deserved a second shot. Previous articleOriental Pavilion @ Jaya 33, PJ – Low Sang 2009 with the extended family! wow did not know there is such a new fried chicken restaurant! hmmm must give a try of the fish than the chicken! 🙂 I am sure they shud sell spinach too! I want some of that succulent fishy! ok…me try the fishy and shrimp (must be small leh since shrimp and not prawn?) this weekend when we stock up kitty supplies, and let u know if nice or not. Were they ever in Malaysia before? (e.g., just like how Wendy’s used to be here eons ago). They look kinda familiar. i’ve never heard of em!!! guffaw, eh, howwwww la ma’am can you compare your grandmother’s fried chicken with theirs? all grandmother’s fried chicken sure taste good one la. sounds very run of the mill huh. wasted calories. dowan dowan. 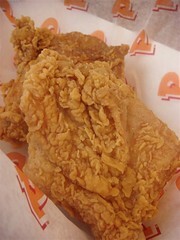 I atcherly like KFC original recipe wor. 😀 But I’ll eat stuff like this just a handful of times a year. 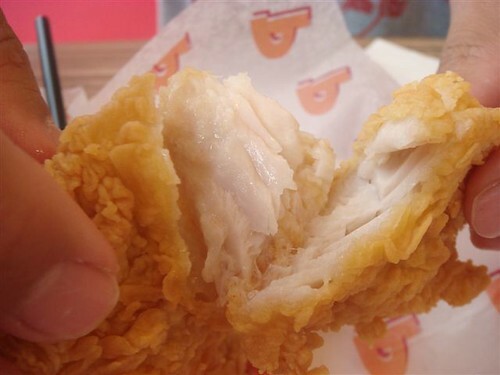 Looking at the pic of the chicken, I can’t imagine it being any better than KFC or other fast food franchises. The fish does look nice, though, but deep fried in batter…oooerrrr…..
*sigh* If tastes like that, wonder whether they will last ..
Yay-hey! Just when I thought we had nothing else to look forward to on the fast food landscape! Surprised they chose the relatively sedate neighbourhood of TTDI to open their first outlet? Or have I missed the other crazytown mall ones? KFC Hot N Spicy good ma, no? some outlets very tasty one. but i am eyeing the Zinger Tower, no thanks to Citygal. ahhahaha …. 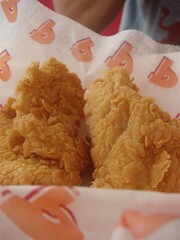 oh, popeye's in malaysia now! awesome! u know, when i saw the word "biscuit", i thought it was those crunchy biscuit kinda biscuit..haha! happy cny, c&c! if y'all cant finish the booze y'all bought, u know who to call…haha! I have this in HKG airport I think Terminal 1. Wonder if it is the same. Happy Chinese New Year to you and your family. Okay, now I’m hungry for good fried chicken. And I don’t mean Popeye’s or KFC. Happy Niu Year! Thanks for stopping by our blog! May the year of Ox bring you all the happiness, good fortune, health and prosperity you wish for. Okie, got it. 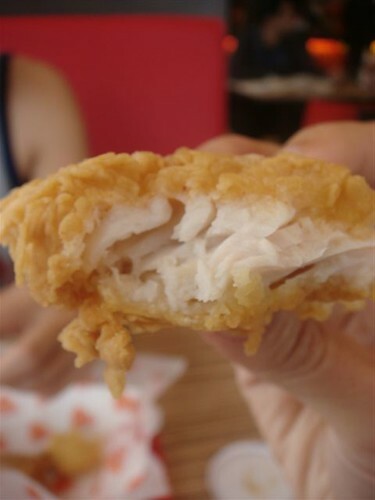 Dump the chicken, load up on the fishies. Hehe. wow… something that actually come to challenge KFC's dominance in Malaysian fried chicken market… after futile attempts from A&W, Merrybrown… let's see how it fares ok??? Just had the fish there for lunch. So fresh and flakey! There was indeed great TARTAR SAUCE to go with it. Best Fish and Shrimp I’ve tasted. Better than expensive Manhattan Fishmarket. Just tried it for a farewell lunch just now. I ordered ala carte 2 pieces of fish. Quite nice that it has tartar sauce. My favourite is indeed the Mashed potatoes! 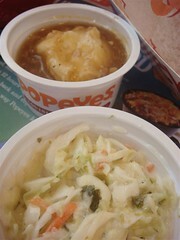 It’s different from KFC’s one that the gravy has small slices of chicken. My bf tasted chicken hot and spicy. Okay juga.